The 2018 GSF session was held over three weeks in the summer of 2018. 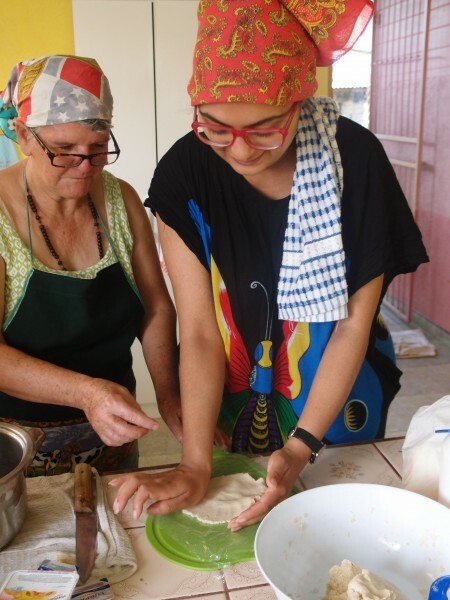 The program took place at the Arava Institute for Environmental Studies, located within Kibbutz Ketura in Israel’s Arava Valley. It welcomed 17 fellows from 15 different countries, and enjoyed diverse faculty members, including three alumni of previous GSF programs. Prior to the start of the program, fellows completed six weeks of online coursework and modules, consisting of an introduction to core topics to be covered in greater detail during the program itself. Additionally, fellows were tasked with developing short presentations about their personal work and interests. Upon arrival at Kibbutz Ketura, the fellows hit the ground running with lectures and other program activities. During Week 1, the fellows were given an in-depth exposure to The Lab’s definition of sustainability and 5 core principles, and took workshops on each of the domains. They also learned about systems thinking, a theory of change, and systems modeling. 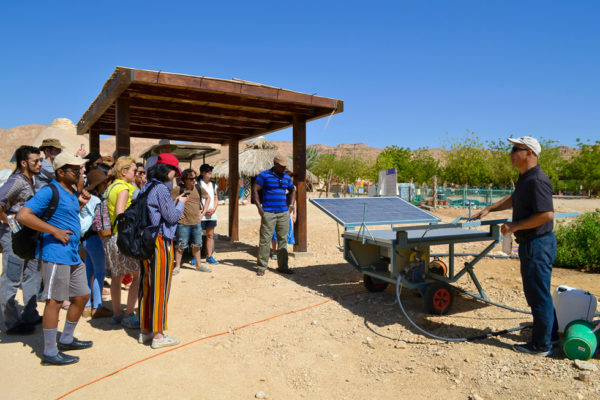 The cohort went on various local field trips to sites of sustainability relevant technology, including a trip to the Arava Institute off-grid village and Renewable Energy lab, Kibbutz Elifaz to learn about wind energy systems in place, and Kibbutz Yotvata to learn about its biogas systems. Fellows also began sharing the presentations that they created during the pre-program, and had the opportunity to present aspects of their cultures through a Culture Night event. Week 1 ended with a day trip to Eilat and the Red Sea. 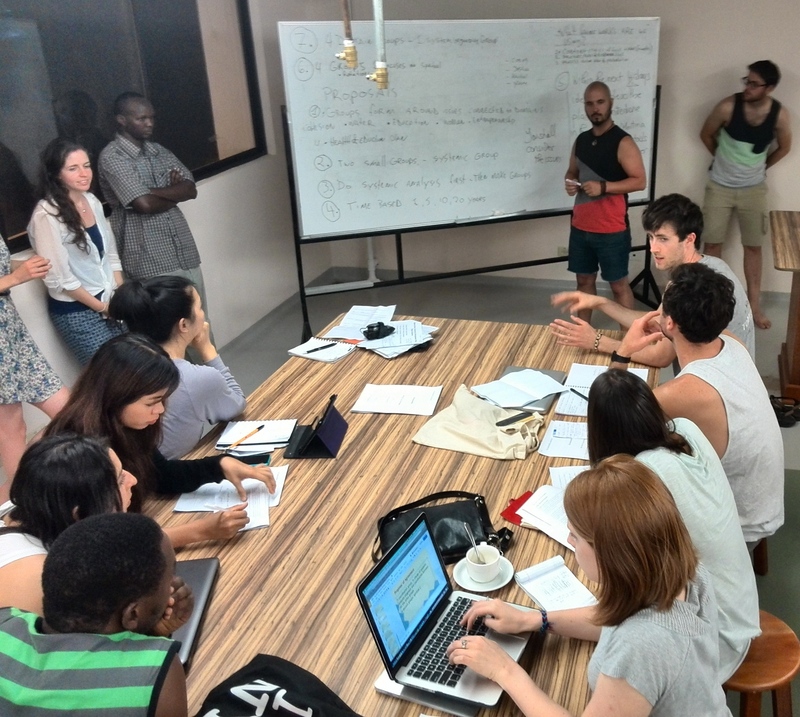 During Week 2, fellows continued with lectures and class time. They delved more deeply into systems modeling, and took workshops on the management of development projects, peace studies, conflict resolution, and civil society processes. 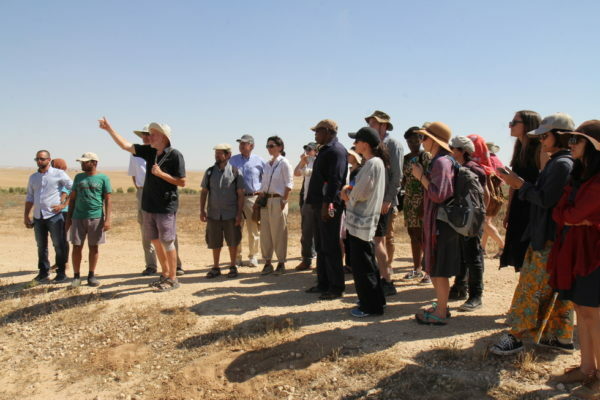 The cohort also learned about specific regional issues, such as transboundary water management in the Middle East, and qualitative research in the Arava region. The GSF cohort spent one day at Project Wadi Attir, the Lab’s flagship project with a Bedouin community in the Negev. This exposed fellows to an example of the actual implementation of The Lab’s sustainability principles. Fellows learned about the various functions at the project, as well as the project’s system of integrated green technologies, including the hybrid wind-solar energy and storage system, the irrigation system, the wastewater treatment system, the composting facility, and the bio-gas production system. The cohort took a tour led by Stefan Leu, the leading research scientist behind the project’s ecosystem restoration initiative, and Amran Amarni, a 2018 fellow himself and the Director of Educational Services at Project Wadi Attir. Week 2 wrapped up with an overnight trip to the desert, in which the cohort spent the night camping with a group of Bedouins, who shared aspects of their culture and knowledge of the desert with the GSF group. Fellows woke up at dawn to experience the desert sunrise, followed by a trip to the Dead Sea. During Week 3, the fellows divided into four different fieldwork groups. Three of these groups were tasked with the analyses of different local, intentional communities through the lens of The Lab’s sustainability framework. Fellows conducted research, site visits, and interviews with members of each community. The fourth fieldwork group was tasked with developing a roadmap for future GSF sessions. Much of Week 3 was dedicated to fieldwork, and fellows went back and forth to their respective sites and began synthesizing their research. 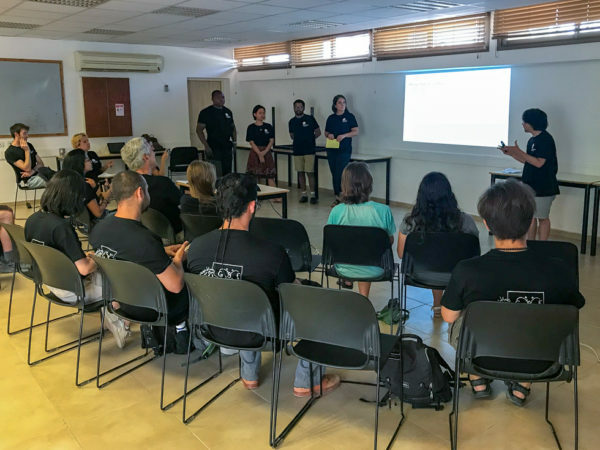 On the final day at Kibbutz Ketura, each group presented their findings in plenary sessions to the GSF fellows, faculty, and members of each respective community. The GSF cohort then moved on to Jerusalem, where they had a comprehensive lecture on the history of the city from local, GSF faculty. The following day, the fellows toured the Old City and then enjoyed a farewell dinner before the conclusion of the program. The 2015 session served as an introduction to core theoretical concepts and the community of Martina Bustos. 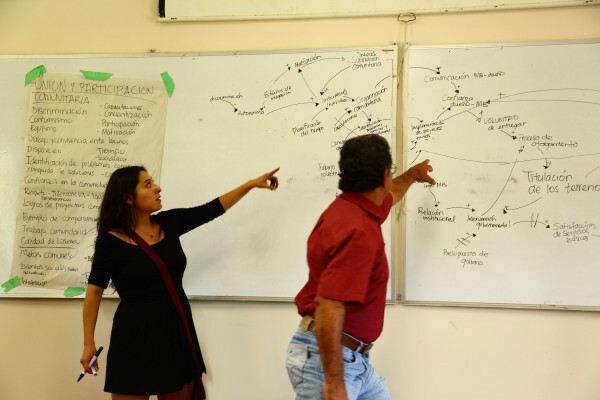 During this session, interested members from the Summer A Session cohort were invited back to Costa Rica to work with the community in developing and delivering a comprehensive sustainable development plan, thereby deepening the practice component that they began the previous summer. The Martina Bustos community, which contains a large population of Nicaraguan migrants, is plagued by numerous challenges, including poor infrastructure, lack of land rights/titles, lack of opportunities for skill development and employment, and weak community organization. Over two weeks, the fellows engaged the community in building a common vision, mapping critical issues, and identifying leverage points for “transition.” Under the mentorship of program faculty, and with the benefit of substantial fieldwork and growing community ties, fellows synthesized the data of regional and community diagnostics and the aforementioned in-depth dialogue sessions into a comprehensive long-term initiative entitled “Project Transition,” which was presented to the greater community on the final day of the program. This will serve as the groundwork for a development project with the community that will be implemented through a partnership between The Lab, EARTH University, past fellows, community leaders, local NGOs and local and national government agencies. The GSF Pilot, Summer A Session took place over two and a half weeks in July of 2014, at the EARTH University campuses in Costa Rica. 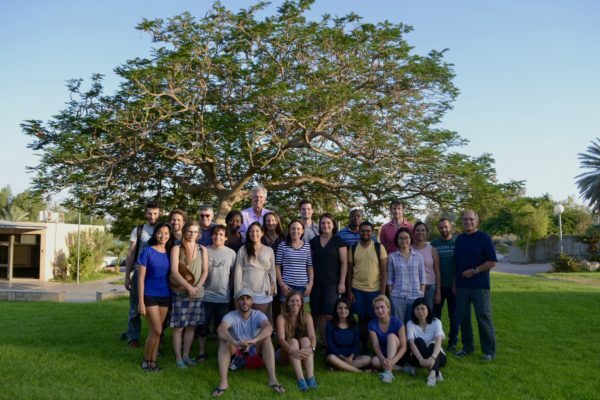 Twenty students from 15 countries on five continents, representing a range of disciplines including System Dynamics, Ecology, Education, Health, Business, Architecture, Urban Planning and more, participated in the program. Following a welcome and orientation session, fellows were placed with a local family for a one-night/two-day Homestay. This experience exposed fellows to the challenges faced by local people in the areas of health, nutrition, education, public services, and infrastructure, and later provided invaluable context for fellows’ fieldwork experience. Following the homestay, fellows were led through five days of rigorous Theoretical Modules aimed at imparting core concepts of sustainable development in a systems-thinking context. During this segment, students also worked and presented in groups around relevant topics. As part of the Eco-Literacy/Eco- Leadership segment, students spent two days visiting sites of ecological importance and local businesses that have been successfully exhibiting environmentally sensitive economic progress. Activities were aimed at enhancing fellows’ sensitivity to ecological issues, while facilitating broader discussion on what effective, responsible leadership looks like in the context of sustainable development. Thus began the weeklong design workshop. During the Fieldwork experience, fellows spent several days becoming acquainted with the community of Martina Bustos, applying the lessons from the theoretical modules to form hypotheses about the best strategies to addressing community challenges. Fellows were provided with the tools, skills, and resources necessary to collect data and analyze the community as a complex, holistic system. Fellows also led community workshops to further conversation and increase cooperation between fellows and community stakeholders. Fellows then spent several days synthesizing lessons and experiences from previous weeks, the background of team member disciplines, and the needs and aspirations of the community, into a useful Presentation and Workshop with the community. At the end of the planning and design sessions, teams presented their hypotheses in a plenary session for faculty, peers, and community members. The fellows succeeded in creating a supportive and critical space for discussion of the project work, and identifying plans that could be implemented with the community in coming years. This segment presented a rare and valuable opportunity to turn theory into applied practice in a short period of time.